Off campus access to most of the library's e-content is managed through our EZproxy® service, which allows authenticated users to get to the database content as if they were on campus. 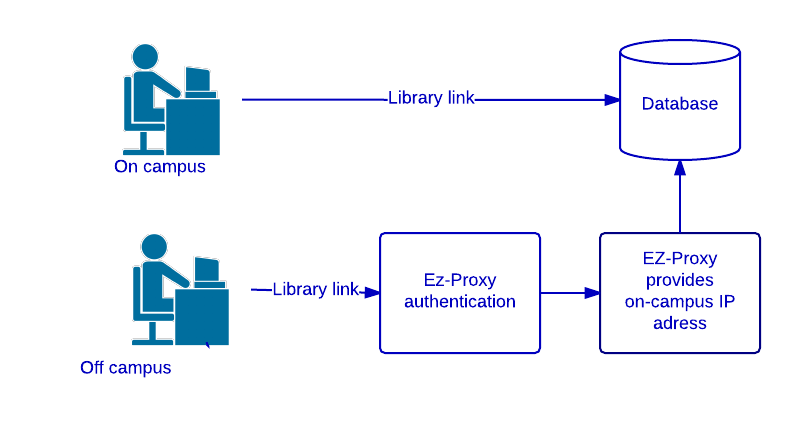 EZproxy authentication is made with your WMU Email credentials. In other words, you will need a WMU email account to access these databases remotely -- from virtually anywhere in the world with an internet connection. Some databases require individual user names and passwords. In the case of Bimco Bulletin, IMO Docs, and the Rosetta Stone online language learning program, the library staff will assign accounts for new students and employees, or upon request. With Lloyd's List, users will need to set up their own account from on campus, choosing their own user names and passwords, and once they have an account they will be able to access LLoyd's from anywhere --until they graduate or terminate employment. A handful of databases and e-journals require a single user name and password for the whole university to share. To obtain these login credentials, users must be on campus or validated through the EZproxy service. The passwords change frequently. Many databases allow users to create accounts in order to provide a personalized experience, such as remembering bookmarks and annotations, or allowing users to "borrow" (download for a limited time) an ebook. Patrons are free to create their own accounts in these systems, with their own choice of user names and passwords. However, having a personalized account in DawsonEra ebooks, Ebrary, Ebscohost, etc., is not sufficient to gain access. Users will still need to access from on campus or be validated via the EZproxy service, at which time they can log in for their personalized experience.